The TC14433A is a low power, high-performance, monolithic CMOS 3½ digit A/D converter. 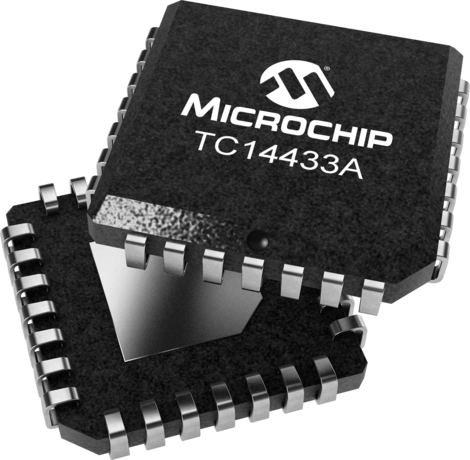 The TC14433A combines both analog and digital circuits on a single IC, thus minimizing the number of external components. This dual-slope A/D converter provides automatic polarity and zero correction with the addition of two external resistors and two capacitors. The full-scale voltage range of this ratiometric IC extends from 199.9 mV to 1.999 V. The TC14433A can operate over a wide range of power supply voltages, including batteries and standard 5-volt supplies. The TC14433A features improved performance over the industry standard TC14433. Rollover, which is the measurement of identical positive and negative signals, is guaranteed to have the same reading within one count for the TC14433A. Power consumption of the TC14433A is typically 4 mW, approximately one-half that of the industry standard TC14433.